Braces are a tried-and-true method for adjusting and repositioning teeth and can be used to help with a wide array of orthodontic concerns. They come in two styles: traditional metal braces and clear braces. 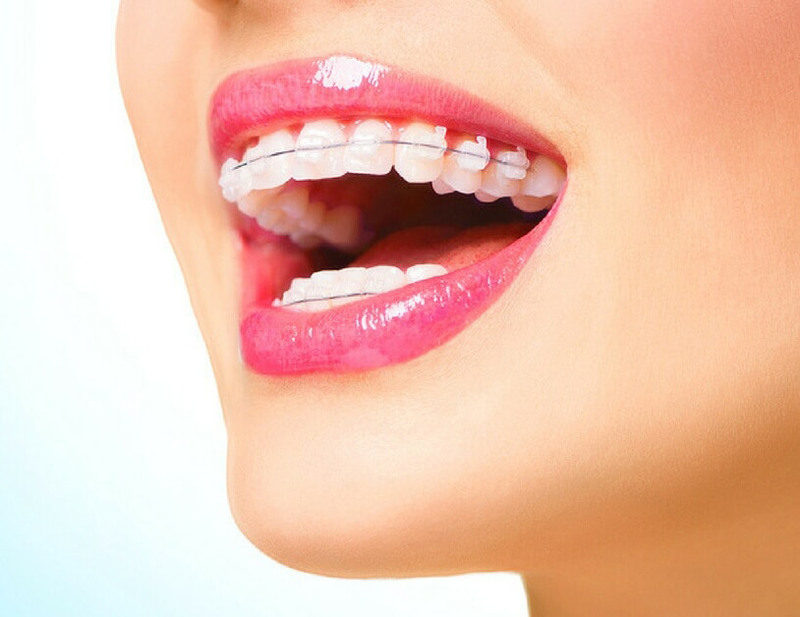 Clear braces, also called “ceramic braces,” use components that blend in with the color of your teeth, making them a discreet, barely-noticeable option for orthodontic treatment. When choosing braces, traditional metal braces and clear braces work in essentially the same way. First, small brackets are adhered to individual teeth. Then, a curved arch wire is fitted through grooves in all the brackets. The arch wire is held in place by small elastic bands and provides the consistent pressure needed to reposition teeth. With clear braces, the components of the braces are tooth-colored to match the tone of the teeth. Brackets are made out of semi-translucent or tooth-colored ceramic that is strong, non-porous and camouflages the bracket on the tooth. The arch wires for clear braces can be metallic or correspondingly tooth-colored, and matching elastics can be clear or tooth-toned. Since their development in the 1980s, there have been advancements in the components of clear braces. First developed from porous materials, staining was an issue for patients with early iterations of clear braces. Today, brackets are made with non-porous material, greatly reducing staining as an issue. Clear braces are like chameleons, blending in with your teeth so they’re hardly noticeable. For any patient with cosmetic concerns, ceramic braces hold “clear” advantages. Clear braces make orthodontic treatment as inconspicuous as possible while still adjusting teeth efficiently and effectively. Most patients love the way clear braces look in their mouth and appreciate how discreet it makes orthodontic treatment. Some patients also report that ceramic brackets feel gentler in their mouth than metal components do, and cause less irritation to the cheeks and gums. Because of the different material used in brackets, the edges of ceramic braces may feel softer to some patients. Clear braces have a similar strength to metal braces, although they can’t be used in all cases. When large adjustments are being made, we may recommend traditional braces as metal components can be easier to work with than those made from ceramic. Clear braces are an option in most treatment situations. Opting for clear braces neither speeds nor slows orthodontic treatment, which is unique for each patient. The length of treatment is different for each individual, but can be estimated with orthodontic assessment. Clear braces cost slightly more than metal braces because of the differences in material. Clear braces are also slightly larger than metal braces, but remain less conspicuous in the mouth because of their color. When you have clear braces, you need to take care of your teeth just as rigorously as you would with metal braces. Food can get stuck in braces easily and if not removed, particles of food can encourage tooth decay and odor. Wearing braces means making a routine of thoroughly cleaning your teeth after every meal. Foods that are sweet, hard and/or sticky should be avoided, like crunchy candy, gum and caramel. The stickiness can adhere food in difficult to reach spots and the sugars feed bacteria that lead to enamel erosion and tooth decay. Similarly, foods with small, hard bits like popcorn or nuts, can get lodged around the clear braces and be both painful and harmful. Although ceramic brackets aren’t susceptible to staining, elastic ligation bands can be colored by food. Dark berries, beets and food coloring all hold the potential to stain the elastic components of clear braces. The upside to this is that elastic bands for braces are replaced at every adjustment visit, so any discoloration they may incur can be quickly replaced. If it’s time for braces, Fox Kids Dentistry & Orthodontics has you covered. Our practice provides specialized orthodontic care and compassionate assessment to help find the best solution for any situation. If you’d like to know more about our options for clear braces, or want to set up an orthodontic evaluation with our board-certified orthodontist, contact us today.